Kyphosis: What is it and How it is Different from Scoliosis? Cervical or Lumbar Kyphosis is not Scoliosis. But, a kyphotic neck spine is common in scoliotic patients. Let our teams help your recovery from Kyphosis or Scoliosis without Surgery. What is kyphosis and How is it Different from Scoliosis? Kyphosis is descriptive of a spinal curve in which the spine is pushed back. 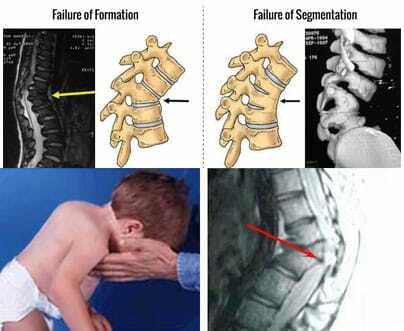 It is a normal finding when present in the upper and mid back (thoracic spine) and abnormal when found in the cervical spine (the neck) or the lumbar spine (lower back). Although kyphosis or a kyphotic curve in the upper and middle back portions of the spine is normal, if these kyphotic curves are excessive, it can lead to issues and disorders. In other words, even the normal healthy kyphosis found in the upper and mid back should be within a particular limit. An excessive kyphotic curve in the upper and middle back can result in an abnormal rounding of the upper back. While the healthy spine has a slight curvature, the curvature can be more pronounced in the shoulder blade area, causing the spine to bend forward more than normal. The condition is known as “round-back” or as “hunchback” in severe cases. Kyphotic curves lead to abnormal function when present in the neck or the lower back. Excess in the kyphotic curve of the thoracic spine (upper and mid back) can cause back pain and neck pain. Additional symptoms such as numbness, tingling or a burning sensation in the upper and middle back, as well as symptoms in the arms or breathing difficulties, are common findings. The patient might occasionally need to do certain exercises or wear a back brace to improve their posture or help to straighten their spine. The one thing that we must point to is that a kyphotic curve is not similar to the curves in scoliosis or lordosis, but a cervical kyphotic curve (kyphosis in the neck) is a common finding in scoliotic patients and, as a result, warrants specialized and targeted care as rendered through our clinical teams. Is a Kyphotic Spine a Painful Condition? In severe cases, the kyphotic spine can lead to spine pain and significant spinal deformity, and eventually, breathing problems. Severe kyphosis may lead to a variety of issues including, but not limited to, slipped disc, disc degeneration, radiculopathy, spondylosis, and even weaknesses in the hands, arms or shoulders. Therefore, the need for care is paramount, as it can progressively worsen over time. This is especially true if you have a scoliotic disorder. While the thoracic spine needs to have a natural kyphotic curve of between 20 degrees and 45 degrees, structural and postural abnormalities may result in a curve that extends beyond the normal range. Hyperkyphosis is ideally the medical term for a curve that extends more than normal, though doctors commonly use the term “kyphosis” or “kyphotic curve” to refer to the condition. A kyphotic curve can affect any patient regardless of age, but the condition is more prevalent during adolescence; a period where there’s rapid bone growth. With a kyphotic spine, the extent of the curvature determines the severity of the condition. Mild curves may have no symptoms at all or cause mild back pains, while the more severe curves produce a visible hump on the patient’s back and lead to a significant spinal deformity. What are the Different Types of Kyphotic Spines? The most common type of kyphotic curve is postural kyphosis, which becomes noticeable in adolescence. It’s usually noticed clinically as slouching or poor posture, but it’s usually not associated with any severe abnormalities of the spine. The curve that results from postural kyphosis is round and smooth, and can often be corrected when the patient is asked to stand up straight. 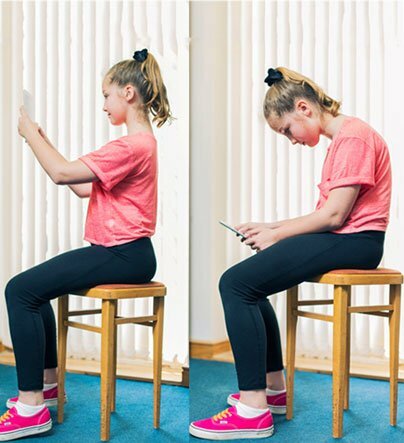 Postural Kyphosis is more common in girls than in boys and is rarely painful. Moreover, since the poor posture curves often progress, it may lead to any problems later in adulthood. Therefore, contact one of our centers today for posture corrections to avoid future problems. This condition is named after a Danish radiologist who described the condition first. Just as with postural kyphosis, Scheuermann’s kyphosis may become apparent during the teenage years. Nonetheless, it can result in a more severe deformity compared to the postural type, especially with thin patients. 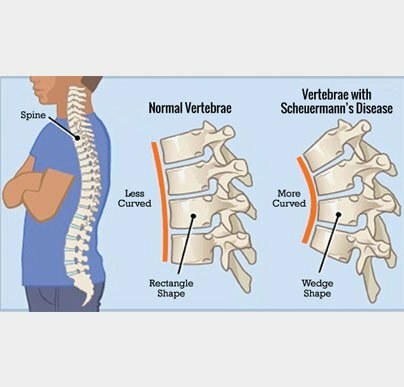 Scheuermann’s Kyphosis is caused by some structural abnormalities in the spine. For patients with this condition, an X-ray image will show a more triangular shape on several consecutive vertebrae rather than the normal rectangular shape. The irregularity causes the vertebrae to wedge toward the front of the spine, which decreases the normal disc space and creates an exaggerated forward curve in the upper back. This form of kyphosis is present at birth. Congenital kyphotic curves occur when the spinal column doesn’t develop normally when the baby is still in the womb. The bones may fail to form as they normally should or a few vertebrae may fuse together. The condition typically ages as the child grows. Severe forms of congenital kyphosis often require surgical treatment at very young ages, which is aimed at preventing further progression of the curve. In many cases, the patients may develop additional congenital disabilities, which affect other parts of the body, such as the kidneys or the heart. The cause of the condition must be considered first when treating a kyphotic curve. As mentioned earlier, severe cases may require surgery, but the mild to even moderate cases can be efficiently dealt with by using our methods of physiotherapy, chiropractic, and targeted rehabilitation that corrects the weakness present in the upper back or the neck. Our clinical teams have the skills, technologies, and knowledge to properly assess and treat your kyphosis without the need for drugs or surgery. If a kyphotic curve is diagnosed early, most of the patients can be treated effectively, without the need for surgery, and resume their active, healthy lives. However, if the condition is left untreated, the progression of the curvature could lead to problems that affect their adult lives. Regular checkups and monitoring are necessary to check the progression of the curve over time. Visit a Chiropractic Specialty Center® today and get a detailed assessment and management plan for your kyphosis. Now that you have a good understanding of a kyphosis and scoliosis, learn about Non-Structural Scoliosis.